A Bayou Bridge Pipeline construction site in Louisiana's iconic Atchafalaya Basin, the nation's largest river swamp. Energy Transfer Partners agreed to halt construction of the pipeline on a parcel of private property this week after a conservation group filed a lawsuit on behalf of a landowner. As the spoils of fracking and the Trump administration’s pro-drilling agenda increase demand for new fossil fuel infrastructure, private oil companies are seizing private property from landowners to build oil and gas pipelines across the country. In most cases, state regulators and courts have granted private firms like Energy Transfer Partners eminent domain or “expropriation” powers by framing their for-profit pipelines as public benefit. Ellen Sue Gerhart, a retired school teacher, grandmother and leading opponent of the Energy Transfer Partners’ Mariner East 2 Pipeline in Pennsylvania, is currently serving a minimum of two months in jail for allegedly baiting a bear onto a pipeline construction site on her rural property — a charge the activist and her family deny. The Gerhart family challenged construction on their land in court and with protests, but Energy Transfer Partners won the right to build on the property and put the family under heavy surveillance, according to family members and their attorney. In Louisiana, at least one journalist and 12 Water Protectors have been arrested in the Atchafalaya Basin and charged with felonies under a newly enacted state law that effectively criminalizes civil disobedience around fossil fuel infrastructure. Activists believe the law specifically targets the direct action campaign against the Bayou Bridge Pipeline. Protesters hold a banner at a Bayou Bridge Pipeline construction site. Four Water Protectors were arrested on felony charges last week while attempting to halt construction of the pipeline on private property that had yet to be legally “expropriated” by Energy Transfer Partners. 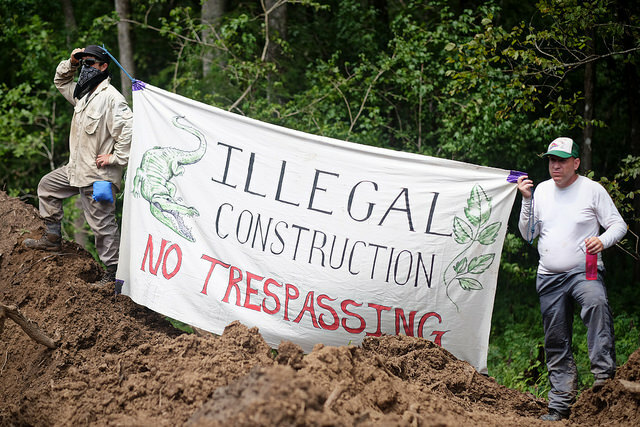 Last week, police aggressively arrested four activists as they attempted to block construction on the land co-owned by Aaslestad and other members of his family. The activists claimed to have written permission from property co-owner Theda Wright and her sisters to be there, but Energy Transfer Partners did not. Mitchell said the property has dozens of co-owners besides Wright and Aaslestad, and state law requires the company receive permission from all of them or take them to court in order to proceed with construction. “I’ve been asked to protect this piece of land and I intend to do it,” said organizer Cherri Foytlin in a statement after her arrest, referring to Wright and her sisters. Meanwhile, activists marched 100 miles in Iowa last week to bring attention to a major legal challenge to the Dakota Access Pipeline, the northern leg of the Energy Transfer Partners oil transport system that faced sustained Indigenous-led resistance at Standing Rock. The Iowa Supreme Court hears oral arguments in the case today, which pits Energy Transfer Partners and the Iowa Utility Board against Iowa farmers and landowners who own property in the pipeline’s path. The Dakota Access Pipeline would pump oil from vast fracking fields in North Dakota across Midwestern states to Texas and the Gulf Coast. There, it will link up to Bayou Bridge, which bisects much of southern Louisiana and is expected to deliver oil to refineries and export terminals. However, unlike a natural gas pipeline bringing fuel to homes, for example, the Dakota Access Pipeline does not serve Iowans directly. In their lawsuit challenging the permit, landowners and environmental groups argue that the utilities board has failed to show that the pipeline will serve the Iowa residents and the public good, so Energy Transfer Partners should be denied broad powers to seize property under eminent domain. The Iowa Utilities Board and Energy Transfer Partners claim that Dakota Access meets federal requirements for interstate pipelines and will bring jobs and money into the state to the benefit of Iowa residents. Transporting oil by pipeline is safer than transporting it by rail, they claim, and the pipeline would promote energy independence to keep fuel prices down for Iowa farmers. In a reply brief on behalf of the landowners, the Iowa Sierra Club points out that gasoline is already readily available to farmers in Iowa without the pipeline in place. Plus, data suggest that pipeline accidents are about as common as rail accidents — a point that was punctuated by a fiery explosion in rural Pennsylvania on Monday, where a natural gas pipeline operated by Energy Transfer Partners and Sunoco sent flames shooting 150 feet into the air. At least one home was destroyed and residents were evacuated. Luckily, nobody was hurt, according to StateImpact Pennsylvania. That pipeline reportedly feeds into the Mariner East 2 Pipeline. In 2017, the Pennsylvania Commonwealth Court ruled 2-1 that Energy Transfer Partners and Sunoco could exercise eminent domain over private property (including Ellen Sue Gerhart’s) to build the pipeline. The court found that the pipeline provides “public benefit” and serves the “public interest.” Much of the liquefied gases it transports from fracking fields in Pennsylvania will be sold outside the state and even overseas. In Louisiana, pipelines such as Bayou Bridge must be a “common carrier for hire” that serve a “public and necessary purpose” in order to “expropriate” private property for construction. Like other parts of the US, pipeline builders typically offer residents some compensation before taking them to court. Mitchell said the initial offers are often paltry and only those who can afford a lawyer can negotiate a better deal. Legal challenges like the lawsuits against the Dakota Access Pipeline in Iowa typically only progress to higher courts when attorneys with large environmental groups intervene on behalf of landowners. Libertarian and property rights groups have also taken interest in the Iowa case and others, a sign that reforming the system for permitting pipelines could gain public support across the ideological spectrum. Lawsuits filed by landowners against Bayou Bridge are still winding their way through the courts, and Mitchell said there has yet to be a case challenging the application of state’s “public and necessary purpose” standard for authorizing expropriation of private land for major pipeline construction. Louisiana is politically dominated by the oil and gas industry, and state regulators have ignored a judge’s order to halt construction of Bayou Bridge after the court ruled that a key permit did not contain an evacuation plan for a historic African-American community in the pipeline’s path. For the activists opposed to Bayou Bridge and other pipelines, the fight is not just about private property rights. Pipeline constructions disrupts sensitive ecosystems in areas such as the Atchafalaya Basin and threatens them with leaks and spills. Continued reliance on fossil fuels only pushes us deeper into the throes of climate disruption. Perhaps courts and state regulators will one day recognize that maintaining a healthy planet serves the public interest as well. An encampment of protesters in Louisiana is resisting the crude oil industry.